I walked into the Gale Bullman Multi-Purpose building this past Saturday at 7:20 am to begin my volunteering stint at the FRC Robotics State Finals Competition, for the state of Missouri. Our son, who is a junior at Rolla High School, is a member of one of the two teams from the high school that had successfully made it to this level of competition. There was a buzz in the air, as bright-eyed, wide awake high schoolers, and a few junior highers, were gathering in a gym, placing their robots on team assigned tables, chatting with each other and looking over the competition. Those kids were a lot more awake than I was feeling;Saturdays are the one day I can sleep in, perhaps to 8:00, if I am lucky! After getting my name tag, an FRC t-shirt( all volunteers wore one), and my green lunch ticket with MS&T’s mascot Joe Minor stamped on it, I found my son and his team, wished them luck, and then found the gentleman who was in charge of queuing. With 3 hours to pass before I had to actually begin my queuing job, I pulled out my library book and got some reading done. As a busy mom of 7, 5 still in the home nest, to be able to just sit and read a book, uninterrupted, is a treasure!! At 10:15, I was joined by two other ladies, and one engineering student from the university who had agreed to volunteer for the event. One of his professors, as it turned out, was instrumental in lining up volunteers from the Rolla area to work at the competition. After our training session was done, we had another hour and 15 minutes to wait before we would actually have teams to queue. We queuers each had one of 3 tables, with a Field number on it. I and the college student were at Field Table 2. In front of each table, about 20 yards away, was a “pit”. A pit, at a Robotics competition is where the robots will move around, trying to do a task in a 3 minute window of time. Whichever teams’ robots do the best at the task will earn points. 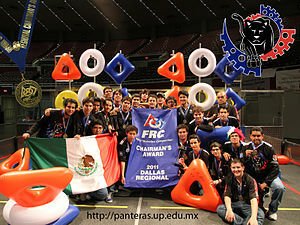 Also, two robot teams would be going against two other teams for this part of the competiton. As a queuer, my job was to make sure that the 4 teams scheduled for specific matches at specific times were at my table. Two of the teams would be assigned to the Blue controllers side of the pit and two would be assigned to the red controllers side. For this year’s competition, racks had been made out of pvc pipes, and robots had to manuever around the pit and take off of holding racks plastic rings, in either red or blue colors, and then transfer the rings to a new center rack. Robots had to work as quickly as possible, and could block opponents robots in the quest to get the most rings onto the center rack. Most of the teams had catchy names. Instead of calling themselves the Tigers, or Bulldogs, or Wolves, as most of their high schools’ mascots were probably named, Robotics teams aim for clever titles, associated with machines. My son’s team’s name is the Maniacal Mechanics. Another team I remembered from another competition called themselves Blood, Sweat, and Gears! Teams also like to jazz up their appearances by wearing matching t-shirts with their team name emblazoned on the front and community sponsors on the back. One team on Saturday decided to dress up, wearing gray dress shirts, black ties, and black dress slacks. They queued up at my table and I told them they got my vote for the best-dressed team, if such an award existed! Some parents came with posters and pom-poms to cheer on their favorite teams. Seeing the parents all excited and revved up to cheer got me to thinking, that if schools have booster clubs to support their sports teams, they really ought to have booster clubs to support Academic teams, like Robotics teams. The robots for these competions are made by the Legos Company, the same company that makes the Legos toys, and these robots aren’t cheap. Add to that the cost of traveling to the competitions, and some teams have to also pay for hotel accommodations if they have traveled in from far away, plus meals for the teams. Civic groups and businesses should be asked to support such Academic Clubs hosted by their area high schools, as the clubs boost learning for their student members, and reflect well on a community-education relationship. If a community isn’t caring about what happens with their local school district, then a part of that positive factor in having successful schools in a community can be neglected and lost. Our son surprised us when he asked if he could join the Robotics Club at Rolla High School this past Fall. He is a bit quieter than his older siblings and younger siblings, so we were quick to say that he could join this club. Our son has not only made some new friends, but he has learned to work within a group, to increase his skills in fixing mechanical problems with machines, and to work out through trial and error the problems that come with building a robot and getting it to do what it must do to be successful at a competition. Not knowing much about the club at first, he did enjoy attending the twice a week meetings, he did enjoy his task of team mechanic, and he didn’t mind the usually 2 hours time slot that meetings took up. In summing up, I marveled at the smarts of all the kids on these Robotics Teams that competed on Saturday. I was impressed by their camaderie when it came to time to meet their alliance red or blue team when they would queue up at my table. I was impressed with the adult sponsors of the teams who would stay nearby in case their teams needed help, or had questions. I was also impressed with the FRC organization who was in charge of the entire day. FRC stands for First Robotics Competition and it was begun by Mr. Dean Kamen in 1989 as a way to encourage and inspire young people to discover the excitement and rewards of science and technology. From setting up the three pits, the queueing tables, the volunteer room that served us breakfast and lunch, and even the background music, it was a very well-managed event and I was glad to have volunteered for it. In fact, I would be glad to help out next year, as I think another competition will be held at MS&T. A day spent around high schoolers who were enjoying themselves and the activity surrounding the competition was a day well spent, for me. In October of 1963 a simple film, a drama, was released in theaters that earned its lead actor the Best Actor Oscar at the Academy Awards. That film was Lilies of the Field, and that actor was Sidney Poitier. 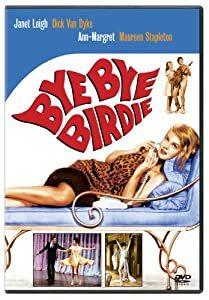 Directed and produced by Ralph Nelson, the movie was based upon a novel that had been published in 1962, with the same title, written by William Edmund Barrett. Poitier’s co-stars in the film were Lilia Skala,Stanley Adams, Dan Frazer, Lisa Mann, Isa Crino, Francesca Jarvis, and Pamela Branch. The title of both film and book were borrowed from the Bible, found in the book of Matthew, Chapter 6, verses 27-33. It is in this section of Matthew that Christ gave his famous Sermon on the Mount. There is also a parallel scripture passage found in the book of Luke, Chapter 12, verses 27-30. The film is an interesting character study, showing two strong -minded people who meet by chance and work together for the good of all. It is a picture about faith, kindness, charity, respect, and love. Not romantic love, but the love one should have for one’s fellow man. Smith soon learns that Mother Maria is one tough lady who likes things done her way and when she gets an idea that something needs to be done, she goes about getting it done, often in unconventional ways. He also learns that this group of nuns is very poor and that the land their convent is on was inherited by their order. The nuns are trying to live on what they can coax the land to grow, and the milk and eggs that they gain from their dairy cow and chickens. Smith decides to stay at the convent that day until he gets his pay for the roofing job, and against his common sense, he reluctantly agrees to stay for a meal and to stay at the convent to do other small repair jobs that have been needed to be done. He does all of this in the hopes that he will be eventually paid by Mother Maria. The nuns secretively study Smith’s skills and strengths while he works at the convent and they become convinced that he is the one, sent to them by God, to make their dream of building a chapel for the townsfolk, who are poor also, as the closest Catholic church is many miles away. When Sunday morning arrives, Mother Maria tells Smith that he will be driving the nuns to that distant Catholic church so they can attend Mass. He is invited to also attend the Mass, but he declines citing his Baptist faith. While the nuns are at Mass, Smith goes to a nearby trading post for a heartier breakfast than what he gets from the nuns’ kitchen. While he is at the post, the owner, Juan(Stanley Adams), tells him about the hardships the nuns overcame to emigrate from Eastern Europe, including getting over that Berlin Wall. By now, Smith realizes it is very unlikely that he will be paid and partly due to the respect he has for the nuns in overcoming their hardships in Europe, he stays longer at the convent and decides to at least clear the land where the nuns have said they would want the chapel to be built. As he works on clearing the land, Smith shares his dream of being an architect and decides that he will undertake the building of the chapel for the nuns. Smith is determined to build a lovely chapel for the nuns, and that only he will build it. The nuns write letters to various philanthropic groups for donations in order to buy the needed construction materials, but the letters only receive resounding No’s from those groups. Word gets around to the townsfolk as to what Smith(or Schmidt, as the nuns call him) is trying to do, and they begin showing up at the construction site with offers to help and even Smith’s boss at his part-time construction job shows up to donate materials. At first, the offers of help and the donated materials irks Smith, as he alone wants to build the chapel, but he soon realizes he can’t do it alone and he accepts the townsfolks help, the materials, and he slowly becomes the construction site manager. After weeks of work, the chapel is complete and Smith insists that he will place the cross on the spire himself and sign his work where only he and God can see it. The movie ends on Saturday night; the next morning, Sunday, the new chapel will have its dedication service. Smith is exhausted and he realizes that there is no more work to keep him at the convent. Mother Maria, too proud to ask Smith to stay on does insist that he attend the dedication service so that he can be recognized for all of his efforts by the congregation. She tells Smith about all of the other projects he can work on for the betterment of the town, including building a proper school. Smith mulls all that she has said while he is teaching the nuns their English lesson in the evening, and during this lesson he tricks Mother Maria into saying “thank you” to him; before this, she had only thanked God for the work, gifts, and help that Smith gave to the nuns. Later on in the evening, as he leads the nuns in singing “Amen”, he sneaks out the door and takes one last look at the chapel. Then he gets in his car and drives away. Mother Maria hears the car engine start but stays seated, singing along with the nuns. The movie was filmed in Arizona on the northern edge of Tucson. It won nominations for not only the Best Actor category, but also in the following categories: Best Supporting Actress for Skala, Best Cinematography-Black and White, Best Screenplay, Best Writing, and Best Picture. It is available through Amazon, and Netflix. As I said earlier, it is not an action flick, no romance, but a fine drama about people working together for the betterment of all. Foods, in their Regional Glories! Having been born and raised in the Midwest and having lived in the Deep South, I have noticed that foods, and some beverages, definitely have their own unique renown. I was musing about this yesterday while baking birthday cakes to surprise two of our sons who celebrate birthdays this week. The cakes I baked, one a Red Velvet with cream cheese frosting and the other a Marble cake with chocolate frosting, were quickly consumed by the teens at Fuel last night;Fuel being the youth group event for high schoolers our teen sons attend on Sunday nights. I was born and grew up in Defiance, Ohio, in the northwestern part of the state. I fondly recall a dish my mom would make in the summertime: fried sweet corn! One had to have fresh, sweet corn to make this dish. Frozen corn or canned corn wouldn’t do. Mom would take the sweet corn, and after shucking it, getting all the cornsilk off of the ears of corn, she would hold one end of the ear on a plate and with a sharp knife, and sometimes with an electric knife, she would cut off the kernels of corn. The kernels would softly fall and make a mound on the plate. 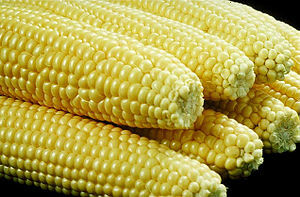 When she had enough kernels, she would melt butter in a skillet, put in the fresh, sweet kernels of corn, add some salt and a bit of pepper, and saute them. Oh how good that dish tasted! For the calorie-conscious, or low-carb dieters, you will want to avoid fried sweet corn at all costs! In the early days of our marriage, my husband came down with a stomach bug. He had to stay on the sofa that day, so I went to the store to get some 7Up soda for him to drink. When I came home and presented him with a glass of the fizzy, citrus-flavored liquid, he looked at me with a questioning look in his brown eyes and asked, “Where’s the Vernors?” I had completely forgotten about that ginger based drink! My late father-in-law had been born and raised in Detroit, MI and there was a Vernor’s Factory in the town. When he was a boy, he said he and his friends would often go to the Vernor’s site and get small cups of the amber-colored drink for a tiny amount of change, maybe even for free, as that part of the story I can’t recall as well. I had to tell my husband that I didn’t even think of Vernor’s for him and in future outings to the grocery stores in our South Carolina town, I couldn’t locate any Vernor’s! Some food items and beverages are definitely restricted to their regions of the country and Vernor’s hadn’t made it to that part of the South.While living in SC, we had encounters with many food items that we had not grown up eating in OH. Boiled peanuts was one such delicacy. Across the Savannah River from our community of North Augusta, SC was Augusta, GA. Hometown of The Masters Golf Tournament and all of those lovely azaleas. In Augusta, there was a holiday store called Fatman’s Forest. It was a unique store, selling decor for the home and decorations for all the holidays one could think of. In October, they would put a huge iron kettle on their front porch. The kettle would be full of boiling, salted water and peanuts in their shells. Some workers would take turns stirring the kettle’s contents with a big, wooden paddle and one could buy these peanuts. The concept was lost on me, so I never tried them. Sweet iced tea I did learn to enjoy, especially due to the efforts of the cafeteria ladies at Schofield Middle School in the city of Aiken, where I taught for 3 years. Every morning, these ladies would have large vats of brewing tea on the stove and to those vats they would add sugar, stirring it well to make sure that all of the sweetness would dissolve into the hot tea. At lunchtime, the ladies made sure every teacher and staff member received a large styrofoam glass full of ice and that tea. It really was a treat, and to have told the ladies that I didn’t want their tea would probably have hurt their feelings. Also at Schofield Middle School, I had my first encounter with sweet potatoes. One of my co-workers had brought some in from their garden and gave me some. Now, my mom never fixed sweet potatoes so I decided to poll my students that day, asking them how did their mamas’ fix sweet potatoes? The majority of them said their mamas’ used butter, sugar, and marshmallows. As my students knew I was a “yankee”, they were eager to inform me of the delights found in a sweet potato! The next day, one of my students shyly handed me a recipe card, on it was printed her mama’s recipe for Sweet Potato Bake. I still have that recipe card and it is the only way I fix sweet potatoes, making sure the dish is a part of our family’s Thanksgiving Day dinners. Instead of the marshmallows on top, the recipe calls for a tasty blend of melted butter, brown sugar, and chopped pecans. After 5 years of southern living, my husband’s new job moved us to the St. Louis area. What new food stuffs would we encounter here? Frozen custard was one of the first. It is not the same as ice cream, as it is richer, and I believe eggs are a part of the mixture as well as cream. Fritz’s was the place we frequented the most for the frozen treat, the Florissant location was our go-to spot. Ted Drewes’s also sells the treat, in the city of St. Louis. Toasted ravioli was another new food concept and one we readily welcomed. An intrepid St. Louis area restaurant owner created the appetizer, a typical ravioli pasta, stuffed with seasoned beef or cheese, then the cooked pasta packet would be dipped in an egg wash, coated in flavorful crumbs and deep fried, sprinkled with parmesan cheese, and served with a warm marinara sauce. Yummy! Toasted ravioli is a traditional food served at St. Louis area wedding receptions! Another item we learned to like was a paczki. It is a large, jelly doughnut, dredged in powdered sugar. The fillings of a paczki( a Polish creation, to English speakers, it sounds like one is saying “poonch-key”) can be raspberry, lemon, chocolate, vanilla, or my favorite, prune; my kids can’t quite believe that that is my favorite filling for these pastries, but it is! Paczkis are a treat to enjoy on Fat Tuesday, or Mardi Gras, and once Ash Wednesday arrives, no more paczkis are made or to be had in St. Louis. The treats are only made in February and one year, for his February birthday, our son wanted only Paczkis, no birthday cake. Another food icon in St. Louis is the lowly pork steak. St. Louisians love to grill these and slather them with barbeque sauce. I have never seen a region of the country that is so crazy about pork steaks! A last food item peculiar to St. Louis is provel cheese. It is hard to describe, but to me, it has the consistency of American cheese, is white in color, and tastes like a smokey-flavored American cheese. St. Louis natives love to sprinkle it on salads and on pizza. 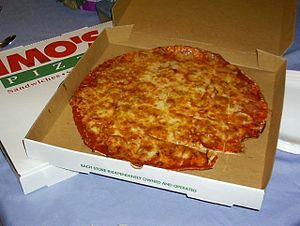 Imo’s Pizza is a chain to the St. Louis area and they use that cheese on their pizzas. Maybe because my husband and I both grew up in OH but we never did learn to like provel cheese or Imo’s Pizza! We must have passed that anti-provel gene on to our children because only 1 of our 7 children will eat Imo’s Pizza! We prefer mozzarella on pizza every time! America is a large country, divided up into regions, each with their own unique foods and beverages to try. I am glad that I have had the opportunities to live in two different parts of the country, to get to know those regions and to appreciate the people, the customs, and the foods! In September 1945, Michael Powell and Emeric Pressburger began production on a new movie for the studio that they created, The Archers. The film, written by Powell and Pressburger, was called A Matter of Life and Death in the United Kingdom. For the U.S. audiences, it was re-titled Stairway to Heaven. This film was one of the more unusual ones that the team of Powell and Pressburger ever created. A romance, with a history lesson, and a fantasy, all rolled into one concept. The British cast members were led by David Niven, Roger Livesey, Marius Goring, Robert Coote, and Kathleen Byron. American actress Kim Hunter was the female lead and Canadian actor Raymond Massey also starred in the movie. The plot centers around RAF pilot Peter Carter(Niven) desperately trying to land his damaged and burning airplane after a mission over Germany on May 2, 1945. His crew has already bailed out as he had ordered them to do, not revealing that his own parachute was all shot up. He manages to contact June, an American radio operator based in England. He talks with her movingly as he knows his life is about to end, and he makes the decision to jump from his plane without a parachute before it crashes into the sea. By all accounts, Peter should have died but Conductor 71(Marius Goring, dressed as a very pompous French Aristocrat, circa the French Revolution) misses Peter due to the thick fog over the English Channel on the night of May 2nd. Thus, Peter wakes up on a beach in England, instead of being led to Heaven by Conductor 71. The next morning, after Peter awakens on the beach and realizes he is alive, he happens to meet June, who is bicycling back to her home for some sleep as her shift has ended. As Peter and June spend time talking to one another, so surprised and relieved that Peter survived the jump, they fall in love. Conductor 71 finds Peter and is able to freeze time, in order to greet Peter and tell him that Peter should really be dead and that he must take Peter to Heaven now. Peter demands that there be an appeal, after all, it’s not his fault that the Conductor messed up. Now that June is in his life, he doesn’t want to go to Heaven. The Conductor has a consult with his superiors who agree that Peter can make an appeal. The Conductor returns to Earth to tell Peter that he has three days to prepare his case for staying on Earth. He is allowed to pick a defense counsel from anyone who has already died, but has a hard time deciding on who to choose. Meanwhile, June has a friend, Doctor Reeves,(Roger Livesey), who is fascinated by Peter’s survival, and thinks that the visions of this Conductor are a result of a brain injury; chronic adhesive arachnoiditis from a slight concussion Peter suffered two years prior. Reeves schedules Peter for surgery to correct the problem and to rid him of the visions. Unfortunately, Dr. Reeves is killed in a motorcycle accident before the surgery is to take place, but now he can be Peter’s Defense Counsel in Heaven. With Dr. Reeves in place for the defense, Heaven chooses its prosecutor for this unusual appeal and Abraham Farlan(Raymond Massey) is picked for the task. Mr. Farlan was the first American who died in the American Revolution and there is no love lost between him and England. He even admits he is shocked and saddened that an American maiden, such as June, and a Bostonian too, could fall in love with an English man! As Peter is given anesthesia and is unconscious for his surgery, the court trial in Heaven begins. Immediately, Dr. Reeves challenges the make-up of individuals in the jury, which are individuals who hate the British. The judge agrees to let this jury be replaced with a mixture of modern day Americans. Events from World History and British History are cited by Reeves and Farlan, and finally Reeves requests that June be allowed to take the stand. This poses a problem as she is still alive, not a resident of Heaven, so Conductor 71 solves that problem by causing June at the hospital, awaiting the outcome of Peter’s surgery, to fall asleep so that she can then give her testimony to the Heavenly court. Reeves proves that June truly loves Peter as she shows that she is willing to take his place in Heaven so that he can go on to have a longer life on Earth. “…nothing is stronger than the law in the Universe, but on Earth, nothing is stronger than love,” says Dr. Reeves in his summation. I won’t reveal anymore about this movie’s end as I want anyone who reads this blog to search out the film on their own to see it! The production team made a very creative decision to film all of the Earth scenes in rich technicolor and all of the Heaven scenes in black and white, a reverse of what was done for The Wizard of Oz. Jack Cardiff, an Oscar-winning cinematographer, shot this film for The Archers, and his love of the craft shows. It is a beautifully lensed film. To convey that it takes a while for the characters to travel to Heaven, a huge escalator was built by a team of engineers. They dubbed the project “Operation Ethel” and it took 3 months to build it and cost 3000 pounds. The escalator had 106 steps, each step being 20 ft. wide, and it was driven by a 12 horsepower engine. Unfortunately the noise from that engine was so loud that all the dialogue for those scenes had to be re-dubbed in studio. There was also a 9 month wait for the film stock and Technicolor cameras because they were in use by the U.S. Army to make their training films! A Matter of Life and Death was chosen for the first ever Royal Film Presentation on Nov. 1st, 1946, then it went out to the general public in the U.K. on December 15th, 1946. It had it’s first showing in America, under a new title: Stairway to Heaven, on Dec. 25th, 1946, in New York City. The Archers Studio, aka Michael Powell and Emeric Pressburger, made wonderful movies to view, usually filmed by Jack Cardiff, with very interesting plots and this is one of my favorites that they produced. Other films in their canon that I have seen and enjoyed are: I Know Where I’m Going, Black Narcissus, The Red Shoes, The Life and Death of Colonel Blimp, Contraband, 49th Parallel, and A Canterbury Tale. A Matter of Life and Death is available at Amazon and Turner Classic Movies will air it on April 18th. Having spent some time fixing snacks for the high school youth group at our church the other night, and having two sons in that youth group, I got to observe the goings on of these “kids”. Sure, teens can irritate me from time to time. But parents can also unwittingly exasperate their kids, especially when they are in that time of not being children anymore but also not having reached adulthood yet. I noticed that most of the teens the other night were clean, polite, telling me thank you and adding a please with their requests. The ones who knew me went out of their way to say hello, to give me a hug, or a wave from across the room. They had fun playing an energetic game that was a cross between volleyball and a tic-tac-toe pattern made of pvc pipes, that fitted together and were raised above the teens’ heads. Most of them had cell phones in their hands, if they weren’t busy with the game or talking with one another, and one teen had even brought along math homework for some tutoring from another teen. Teens love to eat, so the prepared snacks and desserts from an earlier chili lunch the church had hosted, were all eaten quickly. During my observations, I realized that the world of teenagers isn’t really that new, and that the older generation often forgets their own teen antics when comparing their own teen years to the current new crop of teens around them. Through information shared by another blogger who enjoys classic movies, the Lux Radio Theatre is online. I have recently started listening to these radio shows while I am cleaning up the kitchen after supper. My kids have been a bit curious, asking, “Mom what are you listening to?” and it has been educational for them to listen in. I have explained that these radio shows were the main form of entertainment for a lot of Americans before television came along. The Lux commercials are very corny, though, and the other night one commercial spot featured the announcer learning how to talk “teenager” with a girl, probably a young voice actress. The slang she spoke, to let a friend know her slip was showing, was weird, to say the least. Yet it got me to thinking, that even in 1940, when that radio ad was aired, teenagers and their demographics were being used to sell a product, in this case Lux Soap Flakes, and that something peculiar to adults, teen slang, was employed to help sell soap! The teens at my house use a bit of slang too, and to tease them I try to use it and they just fix me with a disdainful stare and tell me never to do that again! So, having their own code, so to speak, from generations of teens from the past to the teens of today, still exists. Sorting through my twin daughters multi-colored and multi-designed anklet socks made me think of their big sister and her stylish habit of wearing mis-matched socks in high school. Who would have ever thought that would be a fashionable thing to do? Or the saggy pants? Or the anti-winter coat trend that seems to have infected my teen sons? Even my youngest, age 9, who is in cub scouts, has a side pocket on his scout shirt to put one’s iphone in, and a tiny hole is in that pocket so one can thread the ear buds cord from the phone through that tiny hole and then into one’s ears in a more convenient fashion! His oldest brother, who is 21, didn’t even have that nifty pocket when he was scout! Times change, tastes change, we all know technology changes, but some aspects of those teenage years don’t. Teens still need the assurance from their parents that they still love them, even when the teen makes a bad decision. They need a listening ear more than an I told you so. They need to be able to get advice and not to be afraid to ask for it. They need to know that they can discuss any topic with their parents. They need to know that mom and dad have “got their back” when tough days arise. They need to know that you, mom and dad, are so grateful that you were blessed with this child, who will not be a child much longer. We can chuckle at Paul Lynde’s performance in a hit musical, playing a bewildered father. We can also know why he is feeling the way he is. But we can’t quit on our teens, shake our heads at them and try to ignore them. Just let them know you are there for them and that you love them. I am also secretly hoping that some day, the “Preppy Look” will re-emerge, which was the fashionable style when I was in high school, in the 1980s. Perhaps it will appear when my 12 year old twin daughters hit their teens. I can only hope! To be fair to our kids, being born near a large city, growing up in the suburbs of a large city, there are a lot of amenities in that kind of area and that is all they knew. It is nice to be able to hop in the car, or take a trip on Metrolink, and go to a baseball game, hockey game, or see a show coming in from Broadway at the Fabulous Fox Theatre downtown. I ,too, missed some of the shopping venues the greater St. Louis area offered and have learned to research online where the closest Target or Toys R Us store is, and then have had that internal, and sometimes external, debate:”Is it really worth the gas to make that 2 hour drive just to shop at such and such store? Do I really need that item? Is there a similar item at a local store? Can I order it online?” That is probably the biggest thing I have had to get used to. I am very glad Rolla did get a Kohl’s store and has a very nice JC Penney’s in town. Now if a Target could be brought in and a Michael’s store and a Penn Station…hint, hint, City Council members and Mayor!! The question resonated a bit differently for my husband and I, comparing life in a big city area to life in a town of 19,559. My husband saw the immediate value of lower property taxes, less traffic snarls, but would probably admit that the slower pace of life in Rolla did take a bit to get used to. I would agree with his assessments, and also note that the land is different. It is hillier here, with curvy roads especially on rural drives, stonier soils, lots of clear water running in creeks and springs, occasional black bear sightings. As we are at the foothills of the Ozark Mountains here, and Arkansas is only a 3 to 3 and a half hour drive away, there is a distinctive twang, a bit of a Southern drawl-like sound to my Northwest Ohio born and raised ears that I catch when some Rolla area folks are talking. I have also noticed that there is a more of a conservative view on life here when compared to St. Louis and it’s surrounding environs. North St. Louis County, where we moved from, almost all political offices were and are still held by Democrats, and unions have a heavy influence there. I would say it’s the exact opposite in Phelps County and Rolla. If the election for the President had been decided in this town, Mr. Romney would be sitting in the Oval Office, and not President Obama. St. Louis has many colleges and universities in its midst, all vying for students. In Rolla, one dominates all of the rest, and is a major employer of the town: Missouri University of Science and Technology, or MS&T. In 1870 the school was begun, under the title of the University of Missouri School of Mines and Metallurgy. As the school grew in size, expanded it’s degrees, added research and more buildings, it had another name change in 1964 to University of Missouri-Rolla, or UMR. In January of 2008, the university once again changed it’s name to MS&T, much to the ire of alumni. My husband works with several alumni and they still refer to their college alma mater as UMR! Irregardless of the name, it provides an interesting contrast to the rural aspects of Rolla. Many students are here from other countries and it is fascinating to me when I observe a group of foreign students at a local grocery store or the ubiquitous Wal-Mart, shopping and chatting away in their native tongue. I wish I could understand their languages when that happens. What do they think of life in America so far? The university has a nice theatre, Leach Theatre, and they do a pretty decent job at bringing in outside entertainment groups for not only the students but for the entire community. Leach also shows free movies and documentaries during the main two semesters on Tuesday evenings, which as a fan of classic movies, that is a nice plus! Probably the only thing our family does agree on is the library. Rolla’s library tries very hard to serve the public, but when one compares it to the St. Louis County Library system, it pales in the comparison. If I could have a magic wand, I would wave more monies to Rolla’s Library so they could be come a mini-STL County branch library! That would be wonderful to behold! To be fair, the librarians and employees at Rolla’s library work hard and are very helpful, always ready to answer a question, so in that respect, they aren’t as grumpy as some of the STL’s County branch librarians and employees were who we encountered off and on for 20 years. MS&T has a library open to the public, but I haven’t explored it yet. I have visions of it only being full of books on engineering, physics, chemistry, quantum physics, nuclear power, mining, calculus, etc. Other than finding a house to live in, our family’s other priority was to find a church to worship at and to grow our faith in. We had been very active members at First Christian Church in Florissant for 20 years, and saying goodbye to that church and all of our friends there was and has been the hardest part of leaving the St. Louis area behind. Providentially, a very good friend in Florissant happened to be good friends with the Youth Minister at a church in Rolla, Greentree Christian Church. Another Florissant friend was also friends with the Children’s Minister at Greentree. Through those two new to us ministers, they helped tremendously in aiding our teens and our elementary-aged son become acclimated to the church, and in helping them to make some connections with teens and kids at the church. This connection, we believe, was God-directed and it has been a blessing to us in making the transition from a larger community to a smaller one. 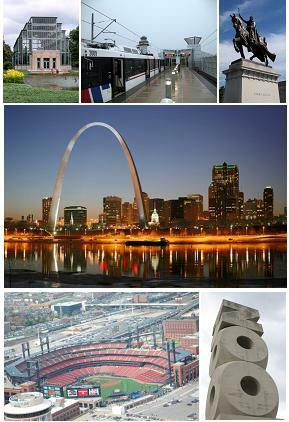 To sum up, life in St. Louis has the plus of lots to do for entertainment, shopping, eating out, all close at hand. It also has the downsides of traffic(but honestly, have you ever driven in Chicago? Chicago traffic makes St. Louis’s look like child’s play! ), higher taxes, and higher crime rates. Life in Rolla is definitely at a slower pace, lower taxes, less traffic, and an interesting mix of people: people from this area of South-Central Missouri, people from other countries and from other parts of the state attending the University, farmers, Amish(there is a growing Amish community); folks working hard to make a living, to do right for their families, raising their children, worshiping God, proud to be from this area of the United States. And, I add, whatever you do, don’t pronounce the town’s name “Roll-uh”. It’s Rall-uh, sort of like Raleigh, but with a Missouri twist.